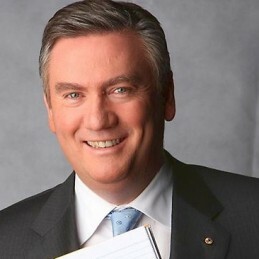 Eddie McGuire AM is a television presenter and businessman known for his long association with Australian rules football. McGuire has worked as a journalist, sports broadcaster and entrepreneur. He has hosted the Australian version of Who Wants to be a Millionaire?, The Footy Show and the game show 1 vs 100. McGuire is the current long-serving president of the Collingwood Football Club. He has written two bestsellers ‘Pants: The Darren Milane Story’ and ‘Footy Show Screamers’. The first job McGuire landed in the media was as an Australian rules football statistician and cricket reporter for The Herald between 1978 and 1982. He then became a cadet sports reporter for Network Ten before transferring to the Nine Network where he became the host of football variety program The Footy Show. The show has been a long time high-profile success, leading the ratings for its timeslot for an extended period. McGuire’s hosting of the 2003 Logie Awards was incredibly successful and continued in and 2004 and 2005. In the mid-2000s McGuire was a Football caller on Triple M radio, a station previously only known for its rock music. He also wrote a football column for the Herald’s successor the Herald Sun. In 1998 McGuire was elected president of the Collingwood Football Club, a powerful club that was dogged by financial and on-field trouble, and returned the club to glory. McGuire took up the role of CEO of the Nine Network between 2006 and 2007 before returning to a position in programming services and more on-screen roles. In 2012 McGuire joined Foxtel’s Fox Footy Channel to host panel shows and pre and post-game broadcasts while remaining with the Nine Network to host Millionaire Hot Seat and the station’s Olympic broadcasts.